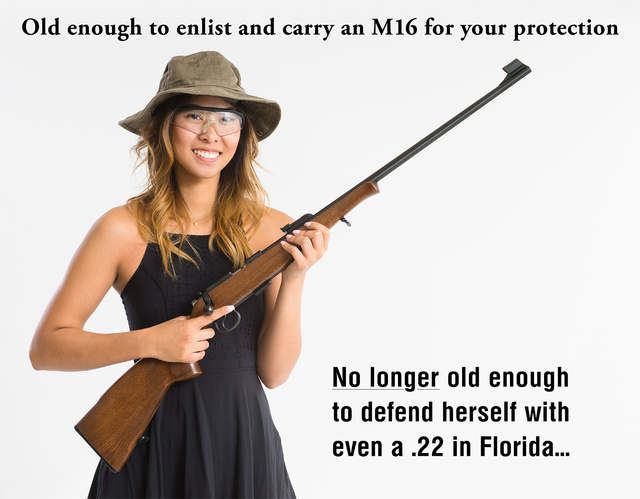 ← Old enough to fight for you…not old enough to protect herself? When is old enough suddenly not old enough? Very much adding confusion to a legal injury, the Florida legislators claim that people who were perfectly capable of legal actions must be stripped of that ability on the basis of their age…which is now insufficient. And yet, the same 18-21 year olds are exempted from the regulation is acting as cops or soldiers to protect the scheming legislators, so they are obviously not incompetent. Should the legislators be similarly stripped of their positions, with their own actions as evidence of obvious old-age mental incapacity? This entry was posted in civil rights, rifle, rkba, self-defense, weapon and tagged 22LR, bolt action, CZ. Bookmark the permalink. 1 Response to When is old enough suddenly not old enough? Being a cop or a soldier doesn’t automatically mean one is mature enough to handle a firearm. It just means you passed the tests necessary to become a cop or a soldier. The majority of police officers are poor marksmen, and a lot of soldiers could use remedial training. If one finds a competent marksman in the ranks of cops and soldiers, that person probably sought out additional training, sadly at their own unreimbursed expense. If it were feasible to spot check a police weapon, you’d most likely find it was ill-maintained. The opposition loves to traffic in data – the interesting stats are that you are more likely to be shot by a cop than a legal gun owner.